KISSIMMEE, FL -- For the first time since buying the Houston Astros in 2011 Jim Crane isn't talking about rebuilding the team. He's talking about winning now. "The goal is to make the playoffs," Crane said as the Astros took the field for the first day of full squad workouts on Wednesday. But the question is whether that's a reasonable expectation for a team that hasn't had a winning record since 2008. Sure, the Astros last year snapped a string of three straight 100-loss seasons, but won just 70 games. "I think it's a possible," Crane said. "There's a lot of things that have to go right and we have to stay away from injuries, but the talent is in the room and in the system." They made a 19-game improvement last season and Crane is looking for another big jump in 2015 which he thinks would put the Astros in the postseason hunt. "If we can get above .500 you have a chance. That's my opinion," he said. "I would be disappointed if it doesn't get to at least there." And just as his team is growing and gaining experience, so is its owner. "The ownership went through some rookie moves and no more rookie moves," Crane said. "We know how it works and we're ready to go." The Astros return a solid nucleus led by 2014 major league batting champion Jose Altuve, slugger Chris Carter and up-and-coming star George Springer, and feature a rotation led by left-hander Dallas Keuchel, who posted a 2.93 ERA in a breakout season. They addressed their biggest weakness from a year ago by signing Luke Gregerson and Pat Neshek to bolster a bullpen that blew 25 saves in 2014. The Astros were fourth in the majors with 163 home runs last season, and increased their power by trading for Evan Gattis and signing free agent Colby Rasmus. That duo combined for 40 homers in 2014. "There's an optimism about this season that didn't exist the last few years," general manager Jeff Luhnow said. "There's always a certain amount of optimism you have because you don't know what's going to happen, but there's an increased expectation and an increased level of optimism for this year." Crane, Luhnow and new manager A.J. Hinch had a 90-minute meeting with the team on Wednesday morning where they shared their expectations for the year and schooled the new players on what it has taken to get the franchise where it is today. Luhnow took time in the meeting to recognize Altuve, catcher Jason Castro and utility infielder Marwin Gonzalez as the only players who have been here since Luhnow took over for the 2012 season. "I feel like we owe it to (them) to go out and help them be part of a winning effort," Luhnow said. "Because ... they've been here all along ... and we know what to expect from them and they're going to go out and there and deliver like they always have, and I think now we've got the people around them to achieve what they want." Altuve hit .341 last season to become the first Astros player to win a batting crown. The diminutive second baseman is confident that the team is on the cusp of success. 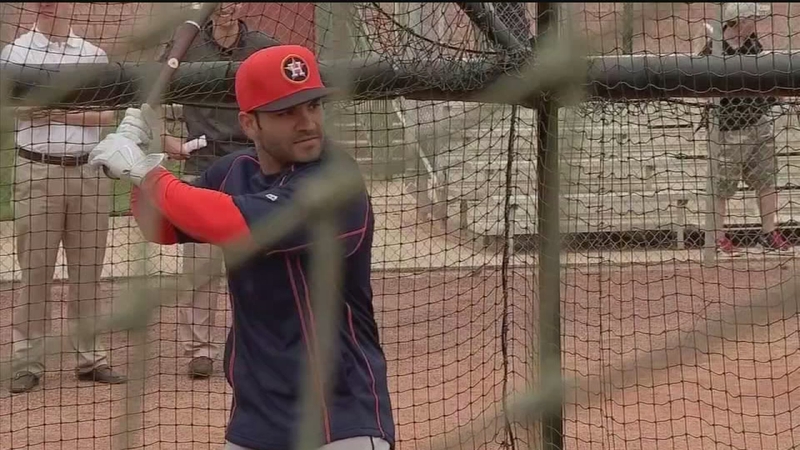 "We don't want to think in numbers, but definitely we're going to be better," Altuve said. "We've got better defense, we have more power in the lineup. Everybody is excited to go out there and show that we've got a different team - a way better team." Another upgrade the Astros made was to bring back shortstop Jed Lowrie, who spent 2012 in Houston. A stellar defensive player, Lowrie also adds a punch to the lineup after driving in 50 runs a year ago. A big question this spring will be figuring out where to put Gattis, who has mostly played catcher in his career, but can play first base and in the outfield. The Astros don't plan to play him at catcher and with Carter as the team's designated hitter and Jon Singleton the returning first baseman they'll have to look at various options to get him in the lineup. After being in baseball's basement for the last few years, some might not believe that the Astros can actually contend this year. But Scott Feldman, a right-hander who was signed before last season to lead the rotation, says he's seen a change in the mindset at the top and thinks it's possible. "It's exciting, especially with all the moves they made in the offseason and seeing the shift in the organization where we're heading in the direction of trying to win," Feldman said. "I can tell we're still trying to build for the future and get better and better with all these young guys, but at the same time we should be a competitive team this year, which is a little different from last year."